Further, during the last interglacial, Greenland temperatures were naturally up to 8C higher and sea levels up to 29 feet higher than today. And, during another interglacial, all of Greenland and West Antarctica melted & sea levels were 79 feet higher. Since this low-CO2 global warming occurred entirely naturally, there is no evidence that global warming during the present interglacial is unnatural or man-made. 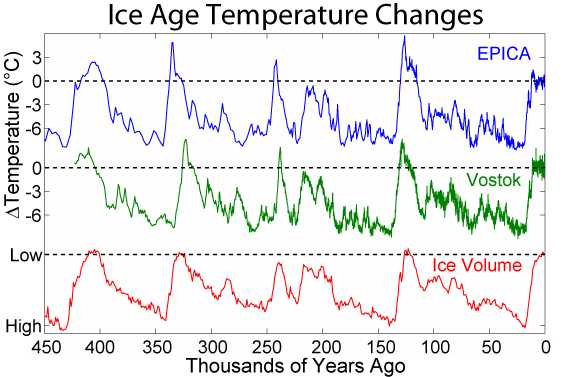 Temperatures during the last interglacial period ~120,000 years ago were higher than during the present interglacial period. First column is the warmest single period simulated by climate models, second column is the warmest period from a compilation of temperature reconstructions. Abstract. The timing of the last interglacial (LIG) thermal maximum across the globe remains to be precisely assessed. Because of difficulties in establishing a common temporal framework between records from different palaeoclimatic archives retrieved from various places around the globe, it has not yet been possible to reconstruct spatio-temporal variations in the occurrence of the maximum warmth across the globe. Instead, snapshot reconstructions of warmest LIG conditions have been presented, which have an underlying assumption that maximum warmth occurred synchronously everywhere. Although known to be an oversimplification, the impact of this assumption on temperature estimates has yet to be assessed. We use the LIG temperature evolutions simulated by nine different climate models to investigate whether the assumption of synchronicity results in a sizeable overestimation of the LIG thermal maximum. We find that for annual temperatures, the overestimation is small, strongly model-dependent (global mean 0.4 ± 0.3 °C) and cannot explain the recently published 0.67 °C difference between simulated and reconstructed annual mean temperatures during the LIG thermal maximum. However, if one takes into consideration that temperature proxies are possibly biased towards summer, the overestimation of the LIG thermal maximum based on warmest month temperatures is non-negligible with a global mean of 1.1 ± 0.4 °C. Every paleoclimatologist knows that the Eemian was warmer and so far longer than the Holocene, and most also know that MIS 11 and 19 were warmer and longer than the Eemian. During the latter two interglacials, the southern dome of the GIS melted away. The Holocene might be another long-lasting interglacial, like those two, since they were at about 400,000 year intervals and the Milankovitch Cycles have again lined up in about the same configuration as then. However the Holocene’s peak warmth was not as hot as during those two or the Eemian. The point of this paper isn’t that the Eemian was warmer than the Holocene, but that GCMs cannot reproduce the temperature regimes of that interglacial or those of MIS 11 and 19. This should come as no surprise. They also fail even more miserably to reproduce the hot, equable climate of the Cretaceous Period. 1) Scandinavia was an island (which is why Lakes Saimaa and Ladoga have ringed seal populations). 2) Hippos swam in the Thames at the site of London. 3) Raised beaches in Alaska. Ok. It was hotter back then. Studies in Florida indicate Eemian sea level stood between 18 and 30 feet above modern sea level. These are by no means new revelations. …From applications of both correspondence analysis regression and best modern analogue methodologies, we infer July air temperatures of the last interglacial to have been 4 to 5 °C warmer than present on eastern Baffin Island, which was warmer than any interval within the Holocene. On these grounds, we ascribe the lower lacustrine unit in these lakes to the climatic optimum of the last interglacial, ca. 117 to 130 ka BP (Marine Isotopic Stage 5e)…. The only useful information in the article above is that in previous interglacials, sea levels were 10 to 20 meters higher than they are now. That is data that is a) difficult to argue with, as it is direct observational data that can be confounded only by profound changes in ground level that one can relatively easily determine independently and correct for (and which are accompanied by commensurate swings in the ice sheet, which are also quite soundly recorded by proxy data, and of course by the radiometric data). In a sense, this renders the issue concerning models moot, if they weren’t already. As the top article notes, one way or another sea levels can go up 10 to 20 meters above their current level in an interglacial, without carbon dioxide, and, since we have no functional models that can explain the timing or severity or detailed evolution of the glacial/interglacial cycle in the first place, with or without CO_2, it is pointless to assert that there is some sort of “cap” on the currently observed climate state that cannot or would not be exceeded without increased CO_2. This does, in a Bayesian sense, reduce the probability that the current warmth is strictly due to increased CO_2. I could formulate a theory such as “prayer works to cure cancer”. I could have a very serious physical model for an all-powerful God who could, if they wished, cure cancer in any individual or prevent cancers from ever occuring, but who chooses to actually refrain from doing so unless petitioned by prayer. I could then easily go out and find a dozen people who had cancer and who prayed and who were cured. Indeed, I might well find that nearly all of the people whose cancer went into remission or who survived for 10 years after surgery or other therapies prayed for a cure at one time or another. I could present this as powerful evidence that prayer works to cure cancer! Except that it isn’t. One can count so very many flaws in this (common enough) religious argument. But the biggest difficulty is that there is no control group, and no double blind experiment, and no effort to even do proper epidemiological work on broad data to determine how prayer alters a baseline non-prayer-based survival rate. The existence of a large group of humans who did not pray (but whose cancer was cured anyway) is, in fact, evidence against the hypothesis. The demonstration that a suitable non-praying population that has a survival rate indistinguishable from an equally suitable praying population within their mutual standard errors would actually be strong evidence of the exact opposite — that whether or not God does or does not exist (Bayesian prior number one), whether or not God can or cannot cure cancer (Bayesian prior number two), it is actually extremely unlikely that God uses “I was prayed to for a cure” as the criterion for acting to cure cancer, if indeed God ever acts to cure cancer at all. So the good thing about the geological record of the climate is that functions, or rather should function, as a sort of control group to confound assertions that greatly exceed the range of reasonable inferences supported by the data. When the daily high temperature outside in Durham, NC on any given calendar day of the year can fluctuate by an easy 20 or 30 C (depending on the time of year) according to the historical record, it isn’t really fair to state that just because the weather has been nice and comparatively cool for two weeks (or, in the current case, an entire summer) that a sudden warming is evidence for anything at all. “Random chance” (or if you prefer, entropy in the system associated with our lack of its precise state or time evolution) can easily explain it without any need or possibility of asserting a specific proximate cause. This is why Mann’s work was so important to the IPCC, so important that it became cover art. Humans actually are pretty good at doing Bayesian statistics in their heads. If today’s temperatures are within spitting distance of MWP, RWP, or Holocene Optimum temperatures, if previous interglacials were even warmer than this one for reasons utterly beyond human control since humans had not, properly speaking, evolved yet, certainly not in any significant numbers, it becomes significantly less likely that the present requires some special explanation because it is in some sense “unusual”. That doesn’t mean that there might not be some special explanation, only that its logical or mathematical necessity becomes easy to doubt, and the predictions made on the basis of that special explanation are substantially “weaker” (less likely to be correct) than they would be if there was a fluctuation that is actually far out of the range of those observed in the past temporally synchronized with the special explanation. Mann — as apparently suggested by some of his peers — managed to find a data model that erased the MWP and LIA, rendering the past behavior smooth enough to fool a gullible public, including a gullible public of scientists who should have known, and done, better once it became clear which way climate funding cookie was crumbling. It is actually more than that. The IPCC argument is “as we cannot see any other reason for the increase in temperatures except for human emissions of CO2, those emissions caused the warming.” They assume a Kelvinesque or La Place Daemon’s knowledge of all variables. As soon as it is shown that natural variance – from whatever cause – is equivalent in all respects, or worse still, as in this case it shows warming in low CO2 conditions; then the IPCC argument is falsified as something else does exist outside their knowledge that can provide reason for the increase. As their knowledge is demonstrably incomplete, they are now bereft of supporting logical argument. You have completely misunderstood this paper. It is showing that there are biases in the way that last interglacial temperatures have been calculated and that these can account for the difference between the model and proxy results. IE the models are doing a good job. And now the clueless Watts is promulgating this nonsense to his credulous audience. You're wrong again - the paper attempts to "partially" NOT "fully" explain model - data discrepancies and finds that there are indeed still discrepancies and natural warming NOT explained by the models. Further, the assumption that it's the data from multiple compilations that is wrong, NOT the models, as is rampant in climate science, is unwarranted. Climate models have been falsified at confidence levels exceeding 98%, thus it is the models which are far more likely to be wrong than the data. This is the 2nd time your criticisms of me are blatantly false and you've exposed yourself as an agenda "scientist"